The “//” forward slashes in any web address actually serve no real purpose according to Berners-Lee. 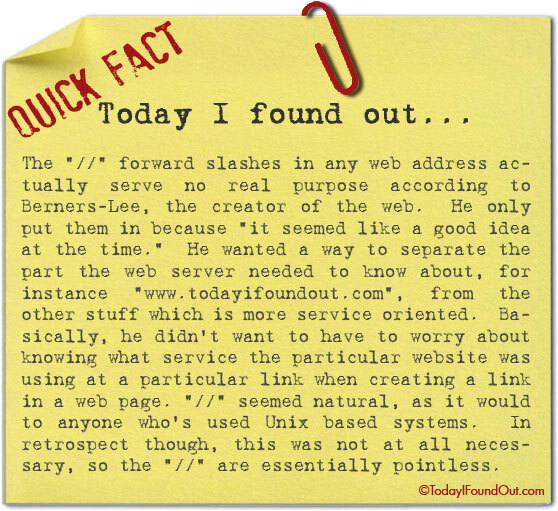 He only put them in because “it seemed like a good idea at the time.” He wanted a way to separate the part the web server needed to know about, for instance “www.todayifoundout.com”, from the other stuff which is more service oriented. Basically, he didn’t want to have to worry about knowing what service the particular website was using at a particular link when creating a link in a web page. “//” seemed natural, as it would to anyone who’s used Unix based systems. In retrospect though, this was not at all necessary, so the “//” are essentially pointless.